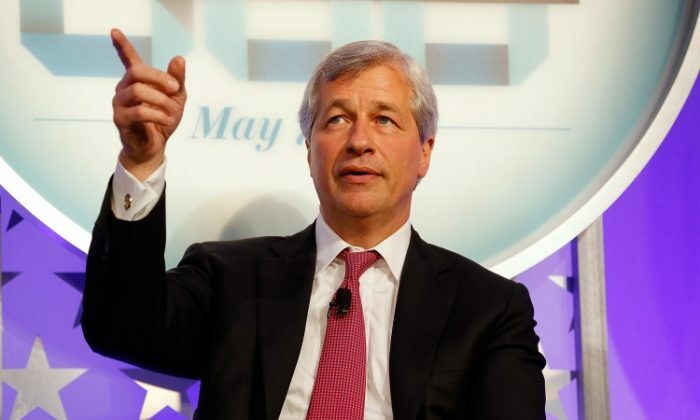 WASHINGTON—JPMorgan CEO Jamie Dimon is perhaps the best example of the type: He thinks bitcoin investors are stupid and that the digital blockchain money “will be closed”—yet his company is developing its own blockchain called Quorum, and it backs a bitcoin competitor called ethereum. Dimon is not alone. Across established institutions like the big banks, the International Monetary Fund (IMF), and the Federal Reserve, there is a pattern of thinking that goes like this: Bitcoin is bad, but blockchain technology is good. “You must not confuse the general concept of a decentralized ledger for trading ownership claims with the specific application of this decentralized ledger that we started with, which was bitcoin,” said Willem Buiter, chief economist of Citigroup, who also called bitcoin an “unfortunate start” to the blockchain revolution. However, he thinks blockchain technology could lead to interbank and central bank settlement systems. Along the same lines, IMF Managing Director Christine Lagarde told CNBC the fund may design its own cryptocurrency to make the IMF money, the Special Drawing Rights (SDR), more efficient. She has also spoken about the possibility of bank and central bank clearing on a blockchain. It would actually not be in our powers to prohibit and regulate [bitcoin]. “Fintech is really in fashion. Is it hype? Is it reality? What is it that is generating that much interest?” she asked at an hour-long panel discussion on financial technology, during the IMF annual meetings in Washington earlier this month. And yet, when discussing the answers to Lagarde’s questions, the panelists made no mention of bitcoin, and there were no bitcoin representatives on the panel. Even intellectuals outside of the mainstream, like best-selling author James Rickards, buy into blockchain technology but don’t like bitcoin. In reality, bitcoin is used for only a fraction of all payments, including criminal activity, which is mostly done in cash or goes through the banking system—hence, the $2 billion fine JPMorgan had to pay because it failed to report the suspicious activity of Ponzi schemer Bernie Madoff. And that’s one of many examples of big banks paying billions in fines because they break the rules. The real issue, however, is control. The establishment hates bitcoin because it can’t control it. “The Federal Reserve chair has said it has no [technical] authority to regulate bitcoin. Transactions will clear if valid, and will not clear if not valid, and there is nothing that regulators can do to overturn the consensus of the network processing power,” writes professor Saifedean Ammous, in a research paper on blockchain technology. The president of the European Central Bank, Mario Draghi, also said as much at the European Parliament in September. “It would actually not be in our powers to prohibit and regulate [bitcoin],” Draghi said. So far, bitcoin is the only cryptocurrency sufficiently decentralized to the point where no individual or single group of people can change the protocol, including the amount of money issued. Any blockchain designed by JPMorgan or the IMF may have a distributed ledger, but it’s probably going to reside behind a firewall and won’t be open source. And even then, there will be a group of people controlling the protocol and the network, which makes it a centralized decentralized solution. Back to square one. The only commercially successful application of blockchain technology so far is digital cash, and in particular, bitcoin. Bitcoin is inconvenient for central banks because it doesn’t allow them to print money at will, and therefore they cannot control the money supply. The banks also cannot control the lending and issuance of their own credit money, the source of their oligopoly profits. It is inconvenient for credit card companies because they cannot control the relatively low fees bitcoin charges for transactions, which may be one reason Mastercard is also backing ethereum. And at the highest level, with the bitcoin protocol, the IMF can’t control who gets how much of its nonexistent SDR money, which at this moment is just a claim on its members’ individual currencies. The IMF could save itself the trouble of developing its own blockchain and make the most successful blockchain—bitcoin—a reserve asset. And yet it shows no inclination to do so. Instead, it talks about controlling and regulating other cryptocurrencies and fintech companies, which are trying to fill the gap in services that banks cannot and don’t want to provide to poorer people, especially in developing countries. If it’s true that bitcoin is sufficiently decentralized such that it cannot be shut down as Dimon would like, or regulated as Draghi says, then there are only two vectors of attack left. The first one is to talk it down like Dimon and Buiter do. This approach has been ineffective, as bitcoin is up 483 percent this year, roughly 48 times better than JPMorgan stock at 11 percent. In fact, when priced in bitcoin, JPMorgan’s stock fell almost to zero in 2017. [Bitcoin] is definitely more decentralized than say ethereum, or Bitcoin Cash, or any of these other ones. So this strategy may have the opposite effect, as more people become curious about bitcoin even if the news coverage is negative. The other strategy is to ignore bitcoin and focus on different blockchain and fintech systems, which was very apparent at the IMF annual meetings in Washington. This strategy is working because many people don’t understand the difference between a system that is truly decentralized and one that is decentralized in name only. So by funding and promoting other blockchain-type solutions, big companies and governments can divert resources away from bitcoin, thereby slowing its growth. This is why bitcoin only has 54.5 percent of the total market capitalization of all cryptoassets worth $176 billion. As for their initiatives, they remain little more than words for now, according to a survey done by Ammous in late 2016.